HEY organizers. will there be a deal with the spirit of tas? Before I start organizing things. I don't know if that has been looked into for OzSTOC members and / or friends. I was part of a large group of Ulyssians thinking about a group booking to go to the AGM at Ulverstone, more than a few years ago now. The requirement was for at least 15 people to book to comply and significant up front payment. This required at least 15 to agree on the same sailing "to" and "from" Tasmania times and dates, and was never gunna happen with the group that I was involved with at the time. I suspect this will be the case with our OzSTOC group. Having said that, there will be three of us sailing to Devonport on the Saturday or Sunday before the NatRally, and then five returning on the Saturday or Sunday after the rally. If you wanna attach yourself to our little group, you are welcome and then we only need another 11 to qualify for a group booking. 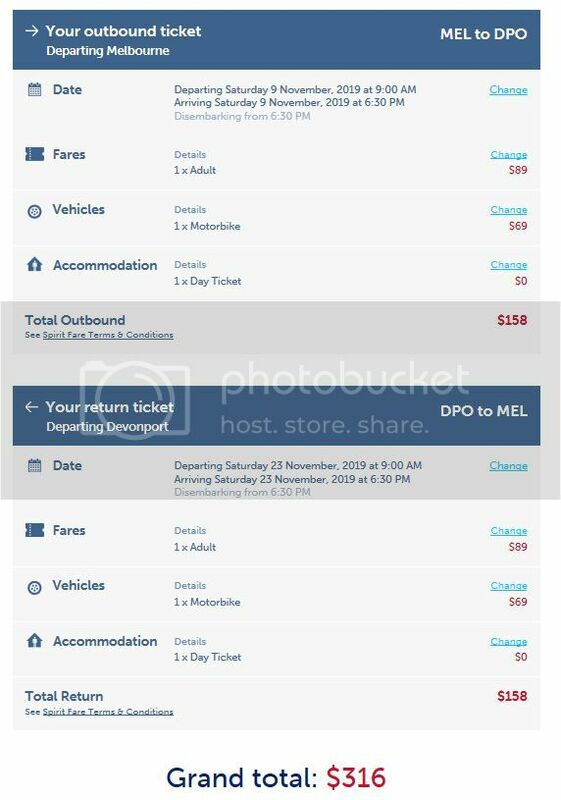 My ferries are already booked and I doubt many Ozstocers will be travelling tha same days as me. I'll have a chat with Dan to see what he is doing. Good! Get Dan over the line and then only 10 more. If you go to Reply #12 above, so far we only have 15 indicated as attending the NatRally, and that includes three (at least) who will be flying over. Ditch Dan, Tania and you will enjoy Tassie more without him. Sighted it....Wanted it...Chucked a fit...GOT IT !!!! The ferry people make a motza and have a captive market. Without competition, they keep printing money. They get a gummint subsidy and ostensibly pocket it, because their fares are outrageous. PC and Marion paid $2000 to take a caravan over and back. With a senior's discount I paid $435 return for the bike and a cabin shared with one other. It's cheaper if you can sleep on one of their recliners. Some can. I can't. I took the recliner option last year and ended up on the floor by midnight (along with many others). Or cheaper for day sailings. Haven't tried that, but it could be worthwhile. Recliners, tried that 45 years (was it the POT then? ), okay as a 20 year old, then on the Spirit in 2011, never again. How much cheaper are the day sailings? I never bothered to look as to me it is a waste of day that could be used riding. Plus the fact I got sick on a ferry from Kagoshima to Naha I hope to crash into bed before the boat gets out of Philip Bay. No cheaper than a recliner ('cause there's not cost of a recliner), but around $35 to $40 cheaper than a four share cabin. One way of looking at it is that it is no waste of time, it's just a matter of sleeping on the boat (ship?) or sleeping in a hotel room (as a higher cost), either way get off the boat early AM, or leave the pub early AM, and start riding. Exactly right. And those who have done the daylight crossing say it's tedious. Unless you play the pokies or Playstation there's nothing to do and the scenery is a tad repetitive. A cabin share with one other person adds $80 each way. The cabins have a tiny ensuite and desk plus a window. There are no day ferries in the week before so that option is out. But there are day sailings on the Saturday before and after. I might give it a go, depends what the others think. I'll look at it as saving a few $$$ to put towards a few more beers. Prices are for one passenger and one motorcycle. Helen will be flying over for a long, long, long weekend (Friday to Tuesday), because I won't go on that boat, not sure yet of costs to fly into Devonport or Launceston, and out of Hobart. But last time we were atop of Mount Wellington, we didn't have those views - there was just way too much low cloud. Has anyone else going by themselves booked a bed in a bunk cabin? How long are OzSTOCers staying after Sunday 17th Nov? I've ridden around a fair bit of Tassie on several occasions so don't really need to go wandering much apart from the Rally rides. I haven't booked yet, but planning on departing Melbourne on Thursday 14th. How long are OzSTOCers staying after Sunday 17th Nov? ........ I haven't booked yet, but planning on departing Melbourne on Thursday 14th. There's three of us planning to head over on Saturday 9 or Sunday 10, then ride & ride, Port Sorell from Friday 15 to Sunday 17, then ride & ride, head home (VIC) on Saturday 23 or Sunday 24. Thanks- that's the sort of input I'm looking for. It seems daft to pay a fortune to go all the way over just to come straight back. But Mrs Biggles isn't coming on this one so that adds another consideration. How long are OzSTOCers staying after Sunday 17th Nov? Bill I'll get back to you after talking with my travelling buddie..we haven't booked return yet. STranger 1998 ST1100, x Police willed to CamHP. I shall be there until the 26th. The wife has given me the go ahead for the trip, but there is one stumbling block to overcome around mid April to May. I do NSW HSC marking, and need to see about the examination dates to workout if I'll be finished by the 14th, which would be my departure date. In the meantime, I will be making plans as if everything is proceeding as normal.